IT would be irresponsible to ignore our most significant event in decades even in a travel column, so this week’s effort is about the universal franchise – or rather, the lack of it. One group of South Africans never had a vote, never had any freedom at all, and yet their contribution to our society has been priceless. These are the slaves of the 17th century Cape Colony. The Western Cape has its unique character because of slaves. There are still reminders of slavery around Cape Town: the Slave Lodge in Adderley Street (now a museum), the Slave Stone where slaves were displayed prior to being sold, the Slave Tree where they waited their turn to go on the block. But their influence goes much deeper than physical relics. The very first consignment of slaves arrived at the Cape on the ship Amersfoort on March 28, 1658. They had been captured by the Dutch from a Portuguese slaver that was on its way to Brazil, filled with captives from Angola. This was the first of only three shiploads of slaves from Africa. The Dutch East India Company (VOC) controlled the Cape and had extensive holdings in the East Indies, so it made sense for slaves to come from Indonesia and Malaya. And they did – thousands of them. Within 50 years of the establishment of a victualling station at the Cape, slaves outnumbered free men. For 176 years (until slavery was abolished) the economy of the Cape depended on slaves. They worked in homes, on the farms, in shops and factories, on building sites. Officially, almost 7 000 slaves were brought to the new colony on VOC-sponsored slave ships, but many more arrived with Dutch East India officials returning home from Batavia. Because the Netherlands outlawed slavery, the officials sold their slaves in the Cape before embarking on the last leg of their return voyage home. A slave’s lot was not a happy one. If they survived the journey (an ‘acceptable’ casualty rate for slaves was 15%), they died of overwork and malnutrion, torture and mistreatment. Many committed suicide. The hardy ones existed entirely at the whim of their masters – punished harshly, executed, married off or sold willy-nilly. It is hard to think that anything good can come out of such sustained human misery, but amazingly, the Cape has some reminders of slavery that are testaments to the resilience of the human spirit. Slaves were cooks and kitchen staff, and they had a huge influence on Cape menus. Our national dishes such as bredie, koeksisters, bobotie, sosaties and tameletjie (toffee) all have Malay influence. C. Louis Leipoldt – a writer and keen cook – was the first Afrikaner to recognise and formalise Cape cuisine, a mixture of East and West. Initially slaves only did menial work, but as slave populations stabilised they were trained in skilled occupations. Slaves were taught to build houses in the Dutch style, but they introduced many little Eastern flourishes in the ornate stone pediments and ornamental gardens. The Castle, Groot Constantia, Vergelegen and Simonsig were all built by slaves. It is believed that Afrikaans developed as a ‘kitchen-language’ – a simplified form of Dutch that slaves learned in order to communicate with their Dutch-speaking masters. Proof of this, perhaps, is the fact that the first Afrikaans was written in Arabic script, and the language is enriched by many Arabic words such as piesang (banana), bredie (stew), baklei (fight), soebat (to plead). There are a surprising number of people who – whether they are aware of it or not – are descended from slaves. A dead give-away is the name: slaves were always given names by their owners, and unimaginative people would choose an easy name such as the month in which the slave was bought (Februarie, September), names of Roman heroes such as Cupido or Hannibal, biblical names such as Moses and Solomon, or whimsical names describing some attribute such as Fortuijn (if the slave was expensive), Witbooi (if they were light-skinned), or from their region of origin such as Basson, Claassen, or Snyman. Slaves were Muslim and introduced their religion into the daily life of the Cape. The Cape Peninsula is ringed by 20 kramats, or holy sepulchres, that have fulfilled a 250-year-old prophecy that a ‘circle of Islam’ will be formed around Cape Town. Some current traditions in Cape Town date back to the days of slavery. On the Prophet Mohammed’s birthday women cut up orange leaves in the mosques. This slave tradition, known as ‘rampie-sny’, is unique to Cape Muslims. The most enduring relic today is the Kaapse Klopse, or Tweede Nuwe Jaar. The slaves got this one day a year off, perhaps because their masters were too busy recovering from hangovers to need their services. Annually, on January 2, the descendants of slaves take to the city streets with bands and dances. The bright street parades and music are a joyous celebration of life over adversity, and a custom as unique to Cape Town as the noon gun and the flower-sellers on Adderley Street. Now wasn’t that Quite Interesting ? Used with kind permission of Niki Moore – a freelance feature writer and reporter currently living in St Lucia. You can read her original article “Throwing off the shackles” here. IT’S Halloween soon, which should have young kids throughout America and Europe wetting themselves with excitement while putting the final touches to their little Frankenstein outfits. But why does Halloween excite South Africans so much? We have absolutely nothing to do with the holiday. Any excuse to celebrate I guess. Halloween is celebrated on the night of October 31. Traditional activities include trick-or-treating, bonfires, costume parties, visiting “haunted houses” and carving jack-o-lanterns – usually out of pumpkins. Most of the customs connected with the day are remnants of ancient religious beliefs and rituals, first practiced by the ancient Druids and then transcended amongst the Roman Christians who conquered them. The American version of Halloween Day celebration owes its origin to the ancient (pre-Christian) Druidic fire festival called “Samhain” – an ancient Celtic festival. Irish and Scottish immigrants carried versions of the tradition to North America in the nineteenth century. The festival of Samhain is a celebration of the end of the harvest season in Gaelic culture. Samhain was a time used by the ancient pagans to take stock of supplies and prepare for winter. It was believed that on October 31 the boundaries between the worlds of the living and the dead overlapped and the deceased would come back to life and cause havoc such as sickness or damaged crops. A feast of the dead was often held, which was intended to give rest and peace to the departed. Participants made sacrifices in honor of the dead, offered up prayers for them, and made oblations. Masks and consumes were worn in an attempt to mimic the evil spirits or appease them. Such festivities frequently involve bonfires, which attracted insects to the area which subsequently attracted bats. Thus the addition of bats entered into the history of Halloween. Trick-or-treating is an activity for children during Halloween in which they proceed from house to house in costumes asking for treats by enthusiastically screaming “Trick or treat! ?” The “trick” part of trick or treat is a threat to play a trick on the homeowner or his property if no treat is given. It has become socially expected that if one lives in a neighborhood with children one should purchase treats in preparation for trick-or-treaters. Trick-or-treating spread from the western United States eastward, stalled by sugar rationing that began in April 1942 during World War II and did not end until June 1947. Part of the history of Halloween is Halloween costumes. The practice of dressing up in costumes and begging door to door for treats on holidays goes back to the Middle Ages, and includes Christmas wassailing. Trick-or-treating resembles the late medieval practice of “souling,” when poor folk would go door to door on Hallowmas (November 1), receiving food in return for prayers for the dead on All Souls Day (November 2). Halloween, or the Hallow E’en as they call it in Ireland , means All Hallows Eve, or the night before the ‘All Hallows’, also called ‘All Hallowmas’, or ‘All Saints’, or ‘All Souls’ Day, observed on November 1. In old English the word ‘Hallow’ meant ‘sanctify’. Early national attention to trick-or-treating was given in October 1947 issues of the children’s magazines Jack and Jill and Children’s Activities, and by Halloween episodes of network radio programs. The Baby Snooks Show in 1946, The Jack Benny Show and The Adventures of Ozzie and Harriet in 1948 all helped to popularise Halloween. The custom had become firmly established in popular culture by 1952, when Walt Disney portrayed it in the cartoon Trick or Treat, Ozzie and Harriet were besieged by trick-or-treaters on an episode of their television show, and UNICEF first conducted a national campaign for children to raise funds for the charity while trick-or-treating. Aunty yo, a South African poi instructor, describes the history and origin of this colorful technique as her students demonstrate the art of poi at the White Mountain Folk Festival held in the central Drakensburg, Kwa-zulu Natal. I HAD my music player on shuffle mode the other day when it randomly came across the great sounds of John Lennon of The Beatles and played Imagine. There is possibly one verse missing from Lennon’s timeless classic, that being: “Imagine there was no monetary system, it’s a little hard to do. No hunger, greed or crime, humankind living as one.” I’m no lyricist, but I think trying to imagine a world where money doesn’t exist should be an important part of such a song. For those of you who are not familiar with the great sounds of Lennon, he was basically trying to encourage people to realise that capitalist society is comprised of a series of complex systems that shape our beliefs and values and determine our behaviour. He then encourages us to use a little imagination and envision a world where such systems do not exist. Wise man was Lennon. I firmly believe that we are a product of our environment. Our behaviour, ideologies and interactions are almost entirely based on the society we are born into, the experiences we have and the media we are exposed to. In other words, our customs, behaviours, and values are by-products of our culture. This society has evolved over millions of years to incorporate various systems of control. Today we are bound by systems of law, education, transportation, religion and, most significantly, the monetary system. We take it for granted that these systems are there and find it difficult to imagine living any other way. In reality, it is these systems that hinder our imaginations, freedoms and human ingenuity. But, we are now entering a new stage of human awareness — a stage which understands that several of these systems are outdated and are in need of serious reform if humankind is to prosper and live as one. And no system is more outdated than our monetary system. The money-based system evolved centuries ago as a device to control human behaviour in an environment with limited resources. Back then scarcity was something very real, but now we have the technology to produce and harvest an abundance of resources. Today money is used to regulate the economy, and to say that things have gone a little pear-shaped is an understatement. In truth, all of the world’s economic systems (socialism, communism, fascism, etc.) perpetuate social stratification, elitism, nationalism, and racism, and are primarily based on economic disparity. In other words, so long as a social system uses money or barter, people and nations will seek to maintain the economic competitive edge. As a result of the imperialistic spread of money-based systems, inequality today is greater than it has ever been. This is because our current monetary system is not capable of providing a high standard of living for ever­yone, nor can it ensure the protection of the environment because the major motive is profit. Similarly, our outmoded political and economic systems are unable to apply the real benefits of today’s innovative technology to achieve the greatest good for all people, and to overcome inequality. Our technology is racing forward, yet our social designs have remained relatively static. In other words, cultural change has not kept pace with technological change. To make matters worse, science and technology today have been diverted from achieving the greatest good for reasons of self-interest and monetary gain. So, what’s the solution? Should we simply burn all our decorated notes with a similar vigour as the bra-burning feminists of the sixties? This may be a little drastic, but let’s picture a world where money didn’t exist. To better understand the meaning of a resource-based economy, consider this: if all the money in the world were destroyed, as long as topsoil, factories and other resources were left intact, we could build anything we choose to build and fulfill any human need. This is because it is not money that people need; rather, it is free access to the necessities of life. In a resource-based economy, money would be irrelevant. All that would be required are the resources and the manufacturing and distribution of products. Simply stated, a resource-based economy would utilise existing resources rather than money, and would provide an equitable me­thod of distributing these in the most efficient manner for the entire population. It is a system in which all goods and services are available without the use of money, credits, barter or any other form of debt or servitude. geothermal, solar, wind and tidal power. When education and resources are made available to all people at no cost, there would be no limit to the human potential. Although it is difficult to imagine, even the wealthiest person today would be far better off in a resource-based society. In such a society, the measure of success would be based on the fulfilment of one’s individual pursuits rather than the acquisition of wealth, property and power. Know that it is now possible to have everyone enjoy a very high standard of living with all of the amenities that a prosperous civilization can provide. This can be accomplished through the intelligent and humane application of science and technology. The choice is ours to make. We no longer need to imagine. In the early days of the typewriter way-back-when (1860) the letters were initially arranged from A-Z along a metal bar. However, as the speed of typists increased, they found that particular ‘type bars’ would jam together, creating several complications, personal distress and making quite a mess of typed documents altogether. One keen mind (American inventor Christopher Sholes) suggested that the most commonly used letters be equally spaced to reduce jams and increase typing speed and efficiency. Quite taken with Mr Sholes’ insightful idea, manufacturers gradually rearranged the letters until fewer and fewer jams occurred. A final rearrangement of the keys introduced the word QWERTY (made up of the first 6 letters along the top row of a keyboard). This has become the most commonly used, modern-day keyboard layout that we enjoy and love and take completely for granted today. QWERTY was patented by Mr Sholes in 1874 and fast became the most popular keyboard layout on English-language computers and typewriter keyboards. It managed to dominate the market after being sold to Remington and whence it became mass-produced in the U.S. The QWERTY layout wasn’t without it opponents however. The early Blickensderfer’s “Ideal” keyboard (1893) was non-QWERTY, instead having the sequence “DHIATENSOR” in the home row. These 10 letters are capable of composing 70% of the words in the English language yet were also met with the problem of clashing type bars when used speedily on a typewriter. Gradual adjustments to the QWERTY layout occurred over a period of several years. One particularly interesting adjustment included placing the “R” key in the place previously allotted to the period mark. 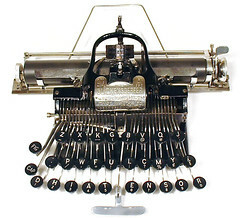 This enabled typewriter salesmen to impress customers by pecking out the brand name “TYPEWRITER” using one row of keys. This was also the longest word in the English language that could be typed using only the top row of a keyboard until the word “proterotype” came into existence. Evidence of the original alphabetical layout of typewriters remains in the second row of a modern-day keyboard, with the letters F-L in alphabetical order (i.e. FGHJKL) – with the exception of the ‘I’ key, which was moved for type-bar jamming reasons. The ‘W’ and ‘E’ keys were swapped around as the naughty (middle) finger is stronger than the ring finger and ‘E’ is the most commonly used letter in the English language. Far more words can be spelled/typed using the left hand (i.e. the left-hand side of a keyboard) than the right hand. In fact, thousands of English words can be spelled using only the left hand, while only a couple of hundred words can be typed using the right This is helpful for left-handed people, however, the combined use of a mouse makes up for the typing advantage of any leftys. SO just who is that fat, old jolly guy in the red suit that parades around shopping malls at Christmas time – entertaining kids and scaring adults with his “ho ho hos”? It’s usually someone’s dad – the one (in any community of close friends) with the biggest beer boep. I caught on early that Santa was my dad and that the whole thing was a scam. The biggest tip-off was the request for brandy or schnapps to left by the tree at night rather than the more traditional milk and cookies. This was suspect, as the order was giving by my mother and my father enjoys his schnapps and brandy and never drinks milk. Images of Santa Claus were further popularised through Haddon Sundblom’s depiction of him for The Coca-Cola Company’s Christmas advertising in the 1930s. The popularity of the image spawned urban legends that Santa Claus was in fact invented by Coca-Cola, or that Santa wears red and white because they are the Coca-Cola colors. In reality, Coca-Cola was not the first soft drink company to utilise the modern image of Santa Claus in its advertising. White Rock Beverages used Santa to sell mineral water in 1915 and then in advertisements for its ginger ale in 1923. Furthermore, the massive campaign by Coca-Cola simply popularised the depiction of Santa as wearing red and white, in contrast to the variety of colours he wore prior to that campaign (a popular garment being a green cloak). The colours red and white were originally given by Nast. Father Christmas, who also goes under the alias of St Nicholas and Kris Kringle, has a bit of a sketchy history – predominantly attributed to legend and folklore. There is also a darker historical account that attributes some of the qualities and roles of St Nic to the pagan deities of Artemis and Poseidon. The most plausible story of Saint Nicholas as an actual human figure dates back to 4th century Myra – a southwest port of modern day Turkey. 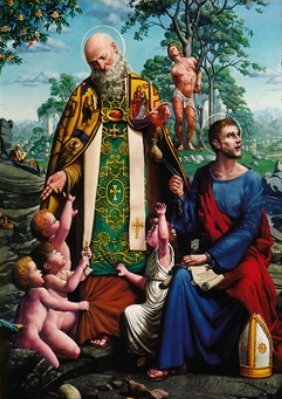 The legend goes that Nicholas was a bishop that took pity on a poverty-stricken family with three daughters, who faced the threat of being forced into prostitution because they had no wedding dowries. To save the girls from this fate, St. Nic tosses two bags of gold through an open window of their house at night and a third one down the family’s chimney (which apparently lands in a stocking that had being hung near the fireplace to dry). This is considered as the basis of the belief of Saint Nicholas as a loving gift-giver, and is believed to be the beginning of the tradition of hanging stocking near the fireplace at Christmas. You can imagine the amount of slave-labour required to make millions of toys each year for all the good little boys and girls. Santa traditionally makes efficient use of child-labour in the form of little elves – popularised by fictional texts such as “The Hobbit” by J.R.R. Tolkien. However, up until the Second World War, it was believed that Saint Nicholas was only helped by one servant. One relatively modern story is that Saint Nicholas liberated an Ethiopian slave boy called ‘Piter’ (from Saint Peter) from a Myra market, who was so gracious he decided to stay with Saint Nic as a helper. At the end of the war, when the Canadians liberated the Netherlands in 1945, they reinstated the celebrations of Sinterklaas for the children. Unaware of the traditions, the Canadians thought that if one Zwarte Piet was fun, several Zwarte Pieten would be even more fun. Ever since, Saint Nicolas is helped by a group of Zwarte Pieten (i.e. little black Ethiopian slave boys). Yet with the influx of immigrants to the Netherlands starting in the late 1950s, this story is felt by some to be racist. Today, Zwarte Piet have become modern servants, who have black faces because they climb through chimneys, causing their skin to become blackened by soot. The commonly cited names of Santa’s reindeer are also based on those used in Nast’s 1823 poem, which is arguably the basis of reindeer’s popularity as Christmas symbols. However, Santa did have a favourite – his red-nosed ‘draw-horse’ Rudolph – who quickly became popularised by the mass media. According to legend, Rudolph was the son of Donder and was born with a glowing red nose, which made him a bit of a social outcast among the other reindeer. However, one Christmas eve it was too foggy for Santa to swing a cat, or to make his flight around the world and deliver pressies to the masses. About to cancel Christmas, Santa suddenly noticed Rudolph’s nose, and decided it could be used as a makeshift lamp to guide his sleigh. Since then, Rudolph is said to be a permanent member of Santa’s staff, who leads them on their journey and gets extra special attention at Christmas! For more information on the history and origin and Santa Claus, his reindeer, his helpers, his legend etc., here is a fantastic online resource.